Entry Fee: $20.00 at event. This Event is sponsored by FishingLakes.com and managed by Santa Ana River Lakes. Our Tournaments feature a 100%+ PAYOUT. No retainer or draw of the Prize Money is kept by the Lakes, Sponsors or Organizers. EVERY DOLLAR received for Tournament BUY-IN, including the additional Sponsor’s Donations, is paid back to the Contestants in Prize Money and Sponsor’s Donations. HOW TO PARTICIPATE IN BOTH THE BIG FISH & BLIND BOGEY EVENTS. To participate in the Tournament, the BUY IN fee is ONLY $20.00 and includes you in BOTH the BIG FISH and BLIND BOGEY Events. You can pay your BUY IN fee at the Tournament Registration Area BEFORE entering the Lake, NO EXCEPTIONS. You will be given an arm band to prove your entry into the Tournament at the Tournament Registration Area. This arm band is good for both the BIG FISH and the BLIND BOGEY events. This arm band must be worn at all times. If you take it off or give it to another person, you and the person you gave it to will be automatically disqualified. Your Tournament BUY IN fee does NOT include Admission to the Lakes, which is paid separately at the Entrance Booth. TOURNAMENT REGISTRATION ENDS AT 8:30AM. 100% of your BUY IN fee is considered the PRIZE MONEY. 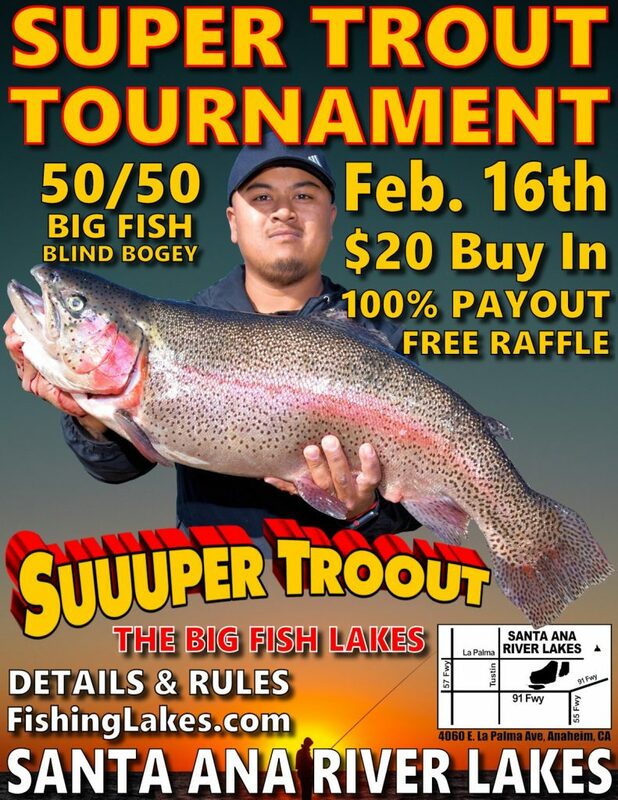 The Prize Money received for the Tournament will be split 50% for the Big Fish event, and the remaining 50% will be for the Blind Bogey event. So if just 200 people entered the Tournament, the total Prize Money would be $4,000.00. $2,000 would be for the Big Fish event and $2,000 would be for the Blind Bogey. If more than 200 enter, the Prize Money will grow larger! All Prize Money will be paid in the form of CASH!! BIG FISH EVENT: WEIGH-IN CUT-OFF IS 2:00pm SHARP!! First Place Receives 50% of the total Big Fish Prize Money. Second Place Receives 30% of the total Big Fish Prize Money. Third Place Receives 20% of the total Big Fish Prize Money. BLIND BOGEY EVENT: WEIGH-IN CUT-OFF IS 2:00pm SHARP!! Be in the Weigh-In Line by 2:00pm SHARP for the Blind Bogey. You will be given a ticket with the weight of the fish you weigh in. A duplicate ticket stub with the same weight will be placed into drawing bucket. Ten (10) random weight numbers will be drawn from that bucket. Save this ticket and present it if your weight number is called out Ten (10) Winners will be selected by the weight of the fish the Contestants weigh in, and will split the Blind Bogey Prize Money, each receiving one 10th of the Prize Money. Based upon 200 Participants = $200.00 each! Any of the three BIG FISH Winners may ALSO enter their winning fish weights into the BLIND BOGEY Event. You may weigh in one fish, or any combination of fish up to five. All fish you weigh must be fish you personally caught. You may not share or borrow other fish you did not catch to obtain your Blind Bogey weight. The Tournament Director will call out the randomly selected weight numbers drawn from the bucket one at a time. If there is a tie, because two or more Contestants have the same weight numbers, the game “Rock Paper Scissors” will be played by the tied contestants to determine the final winner. The Tournament Director will explain and supervise the “Rock Paper Scissors” elimination game, and declare the final winner of the tied Contestants. You MUST be present to win. Claiming a prize of another person is NOT PERMITTED. The weight on your ticket must match the recorded weight for your name. FREE RAFFLE: NO PURCHASE NECESSARY. THE RAFFLE IS 100% FREE. (LAKE ENTRANCE FEE IN NOT REQUIRED) -ANYONE IS ELIGIBLE TO REGISTER & ENTER FOR FREE. TO RECEIVE YOUR FREE RAFFLE TICKETS YOU MUST VISIT THE TOURNAMENT REGISTRATION TABLE DURING THE TOURNAMENT DAY CHECK IN TIME (usually at 5AM – 8:30AM) TOURNAMENT REGISTRATION TABLE IS LOCATED NEAR THE SANTA ANA RIVER LAKES GATE ENTRANCE. YOU MUST REGISTER YOUR NAME FOR YOUR FREE RAFFLE TICKETS. 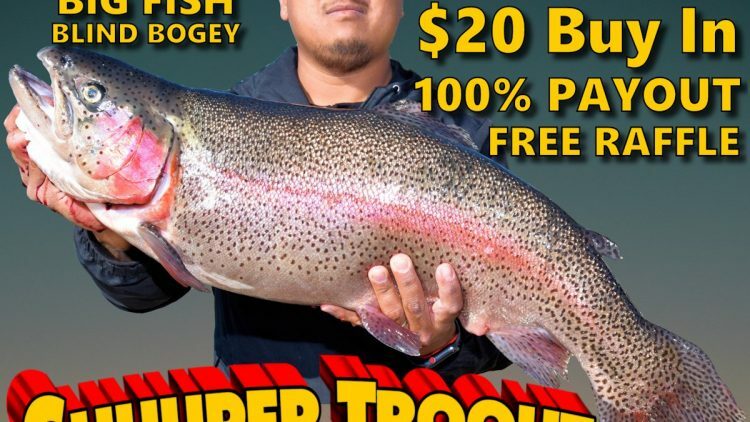 ONLY TROUT ARE ELIGIBLE FOR THE EVENT. TRADING FISH, TEAM FISHING, GIVING FISH TO SOMEONE TO WEIGH-IN, WHO DID NOT ACTUALLY CATCH THE FISH, IS PROHIBITED AND WILL VOID THAT FISHERMAN’S PARTICIPATION IN THE TOURNAMENT, ALONG WITH THE PERSON GIVING THE FISH. The fish must be legally caught, using no more than two fishing rods per fisherman. No more than two hooks can be used on each rod. The fish must be caught by the fish actively taking the bait, lure or jig in its mouth, and not snagged or netted. Catch and Release or Culling for larger fish or a larger limit, is prohibited. Violation of any Derby rules will make the Fisherman ineligible to participate in the Event or receive a payout. If violations of rules are observed, the violations must be reported immediately when witnessed, to the Tournament Director so timely investigation, decision and actions can be taken. Reporting a violation in an un-timely or in an after the fact manor, and or after a payoff has been made will NOT reverse any payoff or the decided outcome. The Tournament Director’s decision on all issues, including the decision to investigate or not investigate any reported violation(s), will be made solely and unilaterally buy the Tournament Director and the Director’s decision will be FINAL. Tournaments and the competition to win prizes can bring out the best and unfortunately sometimes the worst in some people. We hold these events with the hope that everyone will conduct themselves as true “Sportsmen”, help each other, and have fun. Anyone causing problems during the Event, or not following the Lake Rules will be eliminated from the Tournament and asked to leave the Lake. No REFUNDS will be given for either the Lake Entrance Fee or the Tournament Entry Fee, for those who are asked to leave the Lake. By BUYING IN to the Event, you acknowledge that you have read and fully understand the Details and Rules of the Tournament and agree to be bound by such terms and conditions. Now let’s have some FUN! !